Over the years I have greeted each new Francois Carrier album with an increasing sense of expectation. I have never been disappointed. And so it was when his Freedom is Space for the Spirit (FMR 425) arrived in my mailbox recently. Once again I am intrigued. It is some more music from the set of live appearances Francois, drummer Michel Lambert, and pianist Alexey Lapin made in Russia in 2014. This one captures the trio at the Experimental Sound Gallery in St. Petersburg on May 29th. There are five sequences in all, each a completely improvised collective composition by the trio. There is a good deal of density to be had at times on this session. All three have much to say, and say it they do, mostly in a simultaneous fashion. Francois is in his usual excellent form, spinning long and inventive lines with that special alto tone, covering ground that pushes the envelop on the key center and its expansion, its polysemic-polytonal presence that gives pianist Alexey Lapin something substantial and ever flowering to push back against. The push-pull harmo-melodic vicissitudes are heightened by a three-way wash of timbral mixes that makes of the drums in Lambert’s hands a part of the sound spectrum of the whole, something that is much more than the sum of his sound-silent rhythmic choices, though of course that too is a key to the three-way outcome. In other words Michel creates endless permutations of plus-minus possibilities that in turn are dialogued and contrasted by Francois and Alexey. This is state-of-the-art free trio music. And though there are new music vocabulary influences, it nevertheless remains firmly and expressively within the evolved avant jazz orbit as feeling-nuanced open musical speech. If that makes sense to you then depend on this set to present its all in inspired form. If you do not get me think of the flow of Trane-Alice-Ali in the later period and imagine an original string of note chord rhythmic and timbral innovations that comes out of the dialogic possibilities as they developed in the mid-to-late sixties. 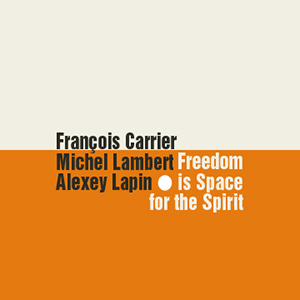 In other words, this is superior Carrier-Lambert-Lapin music that owes a debt to the history of free jazz yet creates highly original sets of total substitutions, inspired variations on near infinite possibility itself. Or forget the words and just listen. It’s some more of the important and beautiful expressions of this potent trio and another welcome feather in the Carrier cap. All kudos for this one!